This book is full of ups and downs, love and hate, anger and forgiveness, lies and truths. It will be a ride that you will not forget anytime soon. Scarlet Stone is in her early thirty’s facing a life altering decision, fight or not to fight. She opts for the later of the two. With this decision being made, she leaves her comfortable life in London to spend the next six months in Savannah, GA the place of her birth. Meeting a Stranger, Nolan, on the plane secures her a place to live for the next six months. This is where the story gets interesting. Not only is she renting a place from a man she doesn’t know, she is living with a man, Theo that she doesn’t know. And he doesn’t want a roommate…at all. He wants Scarlet gone from the first look at her. He has his own plans and a woman messing up his goal is not allowed. Theo is in his thirties and he’s angry at life, at the world. He was wronged, hurt and he wants to seek revenge for those wrongs. Little does he know how entwined everyone’s lives will become. Jewel’s writing is fabulous as always. The ending of the story was my favorite part, to see everything come full circle in their lives. I read this book thinking what would I do if this was me, would I fight or would I make peace. 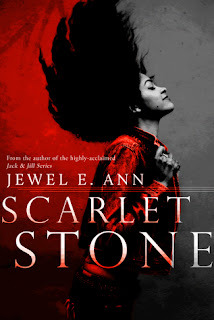 This wasn’t my favorite Jewel story, despite the roller-coaster ride; I found the story too slow at times. I had a hard time relating to the characters. I found Theo to be too angry and cruel.